Dental Surgeon - UNAM (Mexico). Dental Implant Course- Harvard University (Massachusetts). Diplomate in Implant Prosthodontics - Loma Linda University(California). 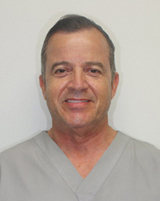 Diplomate in Implant Dentistry - Loma Linda University (California). Advanced Surgical Training - Loma Linda University (California). Implants Esthetics - Nobel Biocare (California). Full Arch Rehabilitation Seminar with All on 4® - Solution United Smile Center (Kentucky). Guide Surgery Planning - Nobel Clinician (Mexico).